The sundew is a carnivorous plant more widespread than the famous Venus fly trap or the pitcher plant. There are over 100 species of the sundew (Drosera)--more than other insect-eating plants. The Drosera species is found across the planet. Sundews prefer temperate or tropical regions; the only area they are not present is Antartica. Sundews have a typical basal rosette structure with leaves at the ground level that circle the growing stalk. The leaves have red tips and "hairs" that produce a gluelike liquid to trap insects. Sundew plants eat many species of insects. Smaller plants can trap and digest small insects such as gnats, while larger sundews can capture moths and even butterflies. Charles Darwin kept a variety of Drosera plants for experimentation. He fed the plants insects, vegetables, raw beef and even poison to study the effects. Sundew plants can be hardy houseplants. Kept inside, the sundew has been proclaimed as an insect reducer effective against the mosquito and common housefly. Remove spent blooms as they die off using a pair of horticultural scissors. Cut the bloom and its attached stalk off at the base. Prune dead leaves from the pitcher plant by snipping them where foliage and stem meet. Dead foliage is either brown or yellow in appearance. Trim foliage that is still alive yet has yellow or brown tips. Cut the foliage just below the line of yellow or brown, leaving only green remaining. The pitcher plant can still absorb sunlight through the remaining portion of green leaf. Tidy up the pitcher plant by cutting back foliage that is growing out of control. Snip off the green vine to a manageable length using the horticultural shears. Removing some of the length of the pitcher plant will encourage basal shoots, giving the pitcher plant a fuller appearance. Pitcher plants are found in many places on the globe. The most common species of pitchers are those found in North America. North American pitcher plants grow wild in the southeastern United States. The plants are also found in some places along the East Coast and in the Midwest. Pitcher plants prefer humid weather and sandy, loamy soil. In the wild, they are found along the banks of lakes and rivers. The plants grow best in wide-open spaces where they are uncrowded and receive unfiltered sunlight. Pitcher plants are carnivorous. 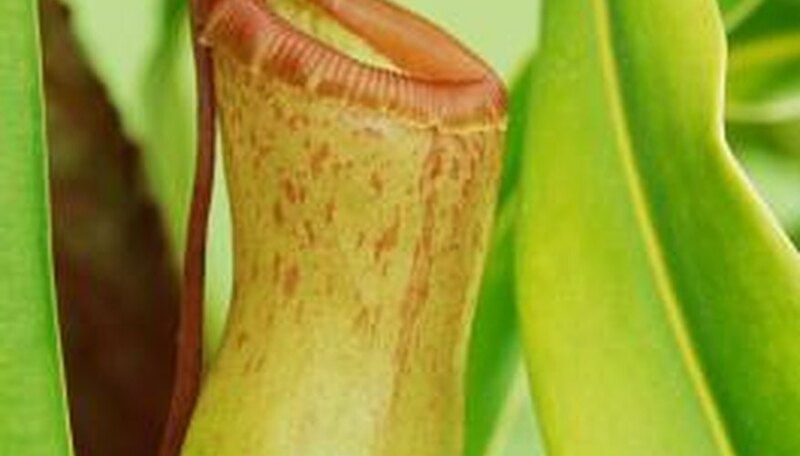 Smaller pitchers consume a diet of insects. Other pitchers eat small frogs and lizards. The largest pitcher plants trap and digest rodents as large as rats. The pitcher plants attract prey with their aroma. Small pitcher plants that feed on insects emit sweet aromas that smell like nectar. The larger pitchers that feed on rodents release scents that smell like rotting meat. Pitcher plants are perennial plants that bloom yearly. The plants become dormant in late summer, when their natural habitats dry out. During the dormant months, pitchers store energy to prepare for the blooming season. Blooms appear April through September. Mix together equal parts peat moss and perlite. Pour the mixture into the planting pot to within 1/2 inch of the rim. Water the soil until the water drains from the bottom of the pot. After it drains, water the soil again, allowing it to drain completely. Create a hole in the soil large enough to accommodate the plant's roots, allowing the plant to sit at the same depth in which it was formerly growing. Remove the pitcher plant from its pot, place the roots into the hole and gently pack the soil around them. Water the pitcher plant until the water runs from the bottom of the pot, and use the misting bottle to spray off any soil that may remain on the leaves of the plant. Hold the pitcher plant in a clean planting container, and fill the container with freshly mixed potting medium. To make the potting medium, combine two parts damp peat moss and two parts clean sphagnum moss with one part washed charcoal and one part clean, coarse sand. Be sure the planting container has a drainage hole in the bottom. Jiggle the pot gently to settle the potting medium around the pitcher plant. Don't tamp the potting medium with your fingers, because doing so will compress the medium around the plant's root system. Water the pitcher plant thoroughly to settle the potting medium; allow the water to run through the drainage hole. After the initial watering, keep the potting medium damp, but never allow the pot to remain in standing water. Use distilled water to water the pitcher plant, because tap water contains salts and minerals that eventually will damage the plant. Put the pitcher plant in filtered or dappled light. Avoid putting the plant directly in a hot window. Initially, a viable seed will fall from the plant and, if conditions are right, germinate. The newly germinated seedling will put out roots into the soil. Because the soil carnivorous plants are grown in is often less than fertile, it will produce specialized leaves to collect food. These leaves may be passive, such as the water-filled pitcher plant that drowns its victims; or active, such as the Venus Flytrap, which snaps shut on its prey. Either way, these leaves help to supplement the nutrition of the plant. As the plant reaches maturity, it will flower, and then will be pollinated. The pollen will fertilize the reproductive part of the flower and seeds will form. Eventually, the seeds will ripen and be disbursed to begin the process again. 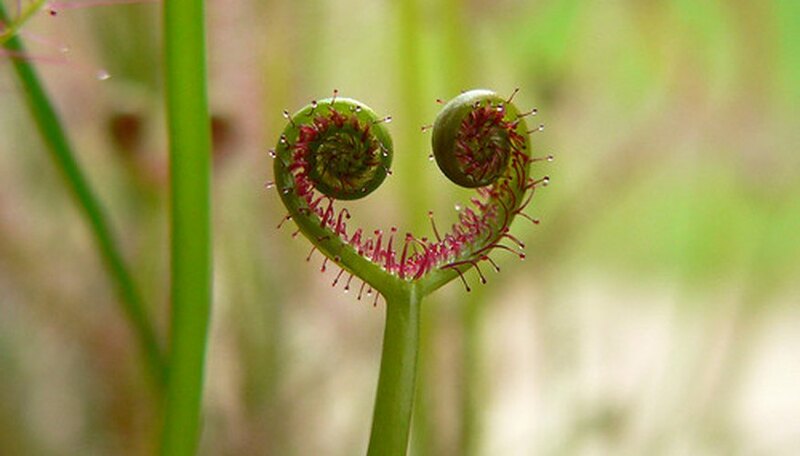 Some carnivorous plants will also reproduce vegetatively. For instance, Venus Flytraps will often sprout little daughter plants at the base of the main parent plant. To be classified as a carnivorous plant, flowering plants must possess the following characteristics: Plants must have a clear means of capturing it prey; prey must die while in the captivity of the plant; plants must be able to digest the prey into a form that can be absorbed; and plants must be able to assimilate the nutrients from the digested prey. Carnivorous plants are grouped by their trapping mechanisms. There are five basic types, categorized as passive or active: pitfall traps, flypaper traps, snap traps, bladder traps and lobster-pot traps. Carnivorous plants reproduce by producing seeds (sexual reproduction). In some cases, the plant divides, causing asexual reproduction. More than 95 percent of the U.S. carnivorous plant habitat has been destroyed through the degradation of U.S. wetlands. Ethnobotany is the study of plants in their relationship to people. Ethnobotanical uses of carnivorous plants include milk curdling and rope making. Some types have also been used in Australia as a food sweetener. Carnivorous plants can be purchased and grown at home. Some popular types include sundew plants, pitcher plants and Venus flytraps. To be successful, home conditions must simulate the natural habitat of the plant. How Tall Is a Venus Flytrap?